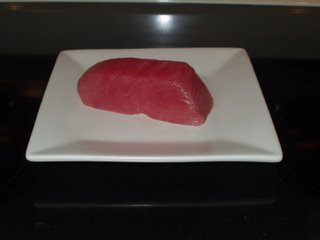 I had the good fortune to have an extra chunk of Ahi in the freezer from a recent dinner I made. It was purchased from Empire Fish in Wauwatosa, WI so it was some pretty good stuff. Anyhow I was growing tired of my usual Ahi recipes which all had an Asian influence so I decided to try something different. I wanted something spicy and sweet so I decided on using a jerk seasoning. I wanted a light marinade as well and opted for Malibu Coconut Rum instead of the usual soy sauce. 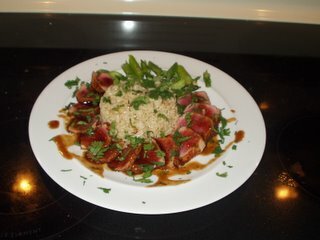 Anyhow the tuna turned out awesome and I think it will be a while before I go back to using soy sauce marinades. Rarely do I like to talk up my own creations and even more rare is the occasion when I get a recipe perfect on the first try. Take the Ahi steaks and if you want, cut them into long rectangles with the same height and width (see picture). This way when you slice the tuna you have nice square pieces. This step is strictly optional but I like it because you get more of that jerk coated crust with each bite. Marinate the tuna in about ¼ cup of the Malibu Rum for about 30 minutes. Rotate the tuna every 8-10 minutes to ensure even marinating. I suppose you could also put the tuna in a Ziploc bag with the rum and not worry about flipping the tuna. Take the tuna out of the marinade and discard the tuna flavored rum. Rub the tuna on all sides with jerk seasoning, salt, and pepper. Heat a pan to high with about 1 tbs of your favorite oil. I used canola to not overpower the delicate taste of the tuna. 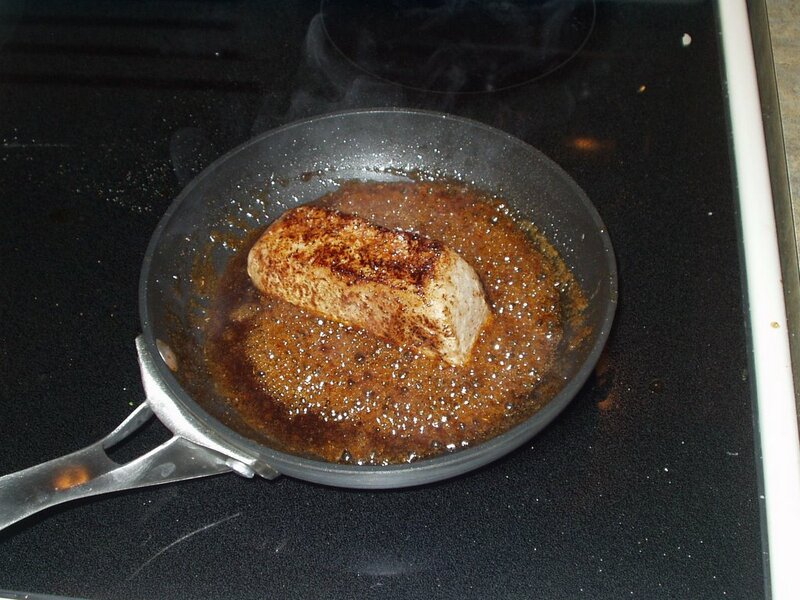 Sear the tuna for about 30 seconds on each side. If you like your tuna more done than rare, adjust cooking times accordingly. Set tuna aside. Add the remaining rum (1/4 cup) to the pan. You may need to flame it off but I didn’t. The sugars in the Malibu will begin to bubble and caramelize as the alcohol burns off. As that time you want to remove from the heat and add the ginger, honey, mirin, soy sauce, and rice wine vinegar. I also added some more jerk seasoning to the sauce. You will want to taste the sauce to ensure you have the right balance of ingredients. My measurements are just an estimate of what I put in there. You also should add your favorite Jamacian style hot sauce (one with habaneros or scotch bonnet peppers). A friend of mine has his own hot sauce company called Man’s Best Friend Sauces. He makes a wide range of great sauces with some pretty unique ingredients. These are not your run of the mill sauces. Anyhow I used one of his Mutt Sauces, which is a sauce that he makes with leftover peppers and other ingredients from his main sauces. This was MBF Mutt #35, which is a great medium heat sauce with tremendous flavor. Ok, enough of the plug for his sauces. Anyhow I used about 1 teaspoon of the Jamacian hot sauce but you should adjust to your taste. Let this sauce simmer on low until it thickens. 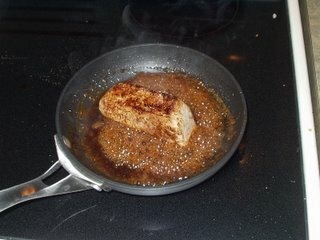 Return the tuna to the pan and flip it around so it is glazed with the sauce. This should only take 30 seconds to a minute. Remove from the heat. Thinly slice the tuna and arrange on the plate however you wish. Drizzle some of the remaining sauce on the tuna and sprinkle with the cilantro. Enjoy one of the best Ahi dishes I have ever tasted. This would go great with some other Caribbean dishes like fried plantains, black beans and rice or coconut rice. Unfortunately I didn’t have any of that stuff so I served mine with some brown rice and asparagus. Since I didn’t want to mess with the flavor of the tuna I just steamed the asparagus in the microwave and added some Penzey’s grey salt. I was surprised how great something so simple could taste. The grey salt brought out the flavor of the asparagus better than any of the seasonings I typically use.